Hello and Happy Halloween! I honestly can't believe that we have already stepped foot into November, where has the year gone? Before we know it we will be hanging tinsel and sipping mulled wine (well some of us anyway). Earlier this month we took the kids to see Disney on Ice and to be honest it came as a bit of surprise to us all as both hubby and I kinda forgot that we bought the tickets ages ago, don't you just love it when this happens? We didn't tell the kids we were going and it was so lovely to see the excitement and complete shock light up on there little faces as soon as we walked through the arena doors. The show was amazing and the ice skaters did such an awesome job, just a shame that the much loved Elsa didn't make an appearance in the end, one little girl was very disappointed. Many of my old readers will know that even though I love a good plan, I also like to wing things, nothing is more satisfying that just going with the flow to see where we end up. 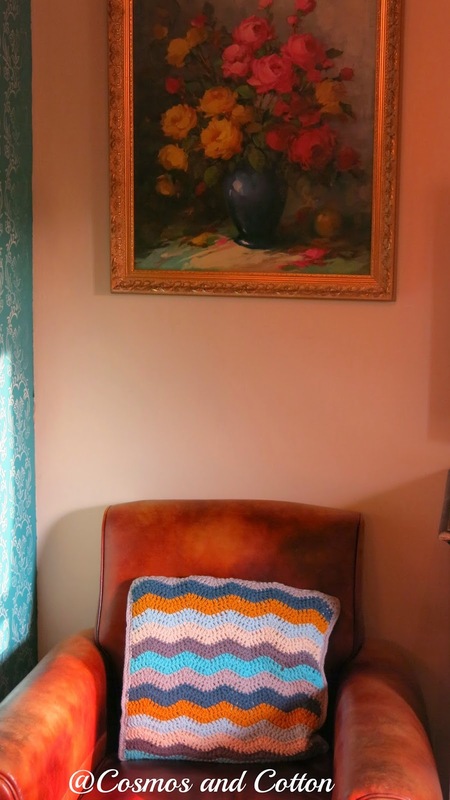 When I started this blanket, I made no attempt to try and calculate how many squares I would need, in fact I went and bought 9 balls of wool in colours that I liked and thought that that would do the job. Well, it seems that unless I want a toe warmer I might have slightly misjudged the situation. 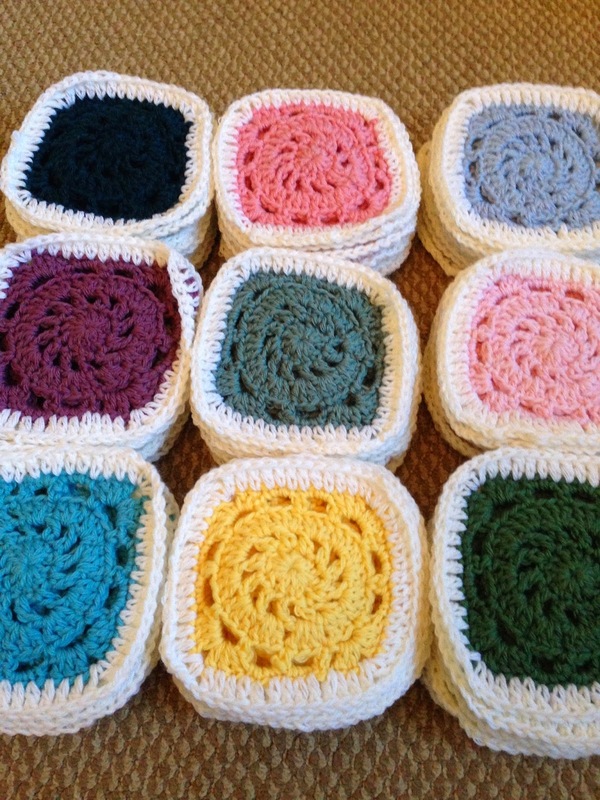 As a matter of fact it seems I am going to need a great deal more squares before I can call it a blanket of sorts. So I am interested to hear from those of you who have made a blanket big enough for a single/small double, how many balls of wool did you use? So sadly for now, I have had to move it to the back burner to make space for other little projects that I need to work on, but I am still enjoying admiring them from a distance as they do look rather pretty and cheery. 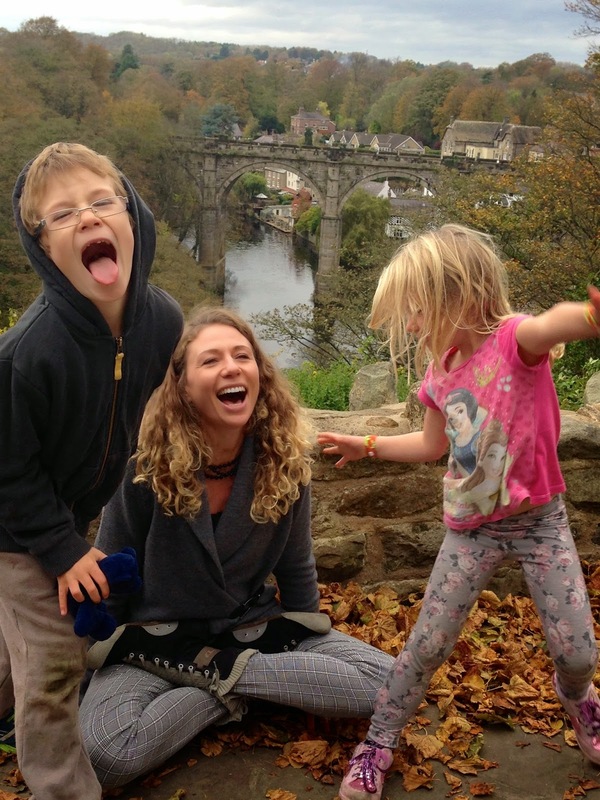 At the beginning of the school holidays we set off to visit a good friend of mine who lives in Knaresborough. 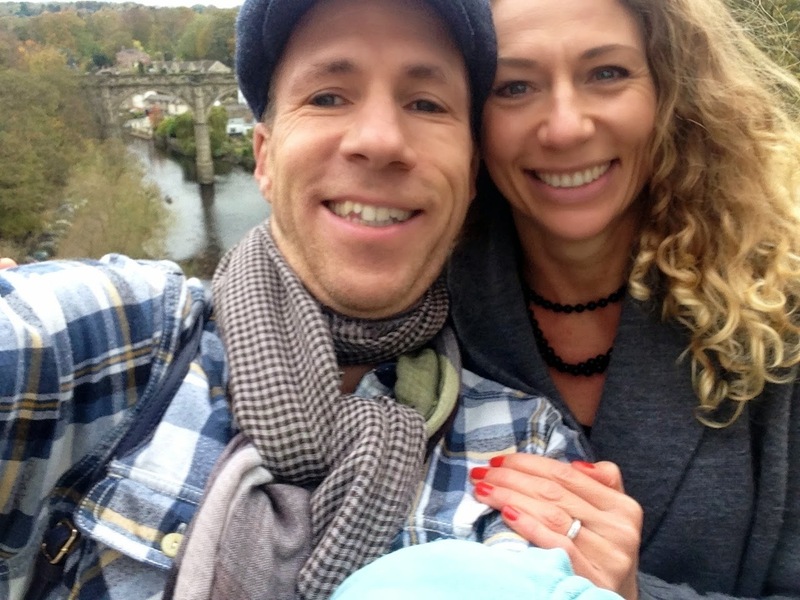 We had such a lovely weekend with them and enjoyed a really lovely visit to the 12th century Knaresborough Castle, which I must say was rather fabulous. I love spending time in Knaresborough, it is such a pretty market town. 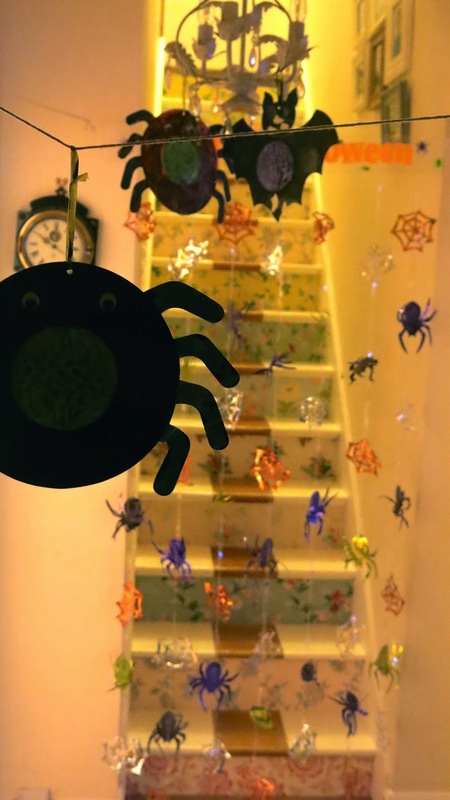 Halloween is something my kids, especially little Es talks about all year long, in fact she absolutely loves it, so needless to say this week our house was running high on Halloween fever. 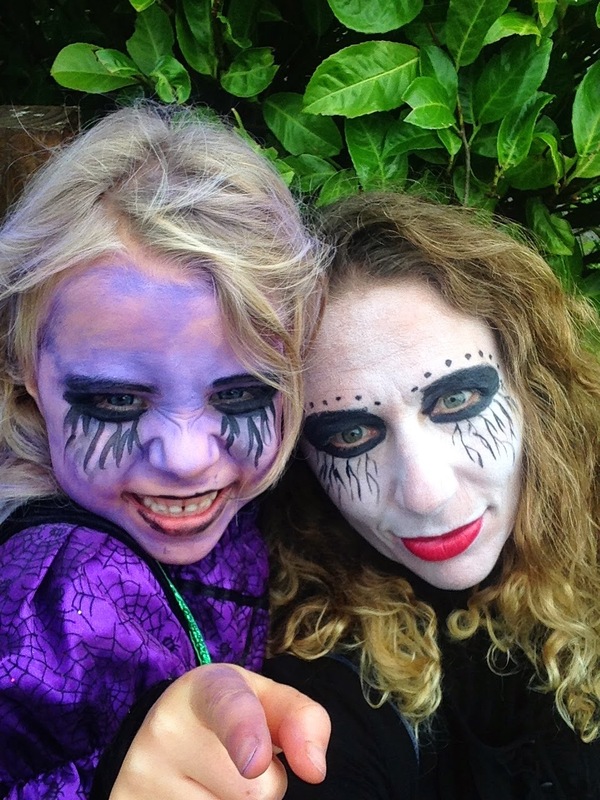 a little more fun decorating ourselves before we set off to go and watch The Book of Life at the cinemas dressed and ready to scare. In fact I had to do a little alterations to my make up as I didn't want kids running out of the cinema because they were too scared of the woman sitting behind them, so I opted for red lips rather than stitched up lips in the end. The kids had a ball trick or treating and came back with enough sweets to last a month, so all in all two very happy kids. Happy Halloween!! 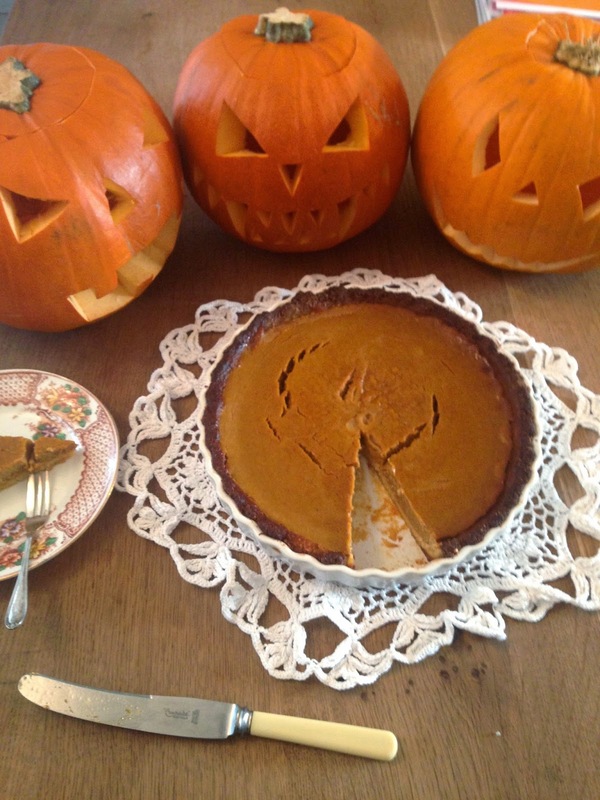 I even managed to do a little experimental baking on the day and ended up with a grain free and dairy free pumpkin pie, which to be honest was so so easy to make and both me and hubby (who are both paleo now) absolutely loved it, in fact ssh don't tell anyone but its gone. At least this time of year we can blame the ghosts, now who said whooooo?! I shared the recipe on Instagram, but for anyone interested here goes. Simply mix all these ingredients together and then push it into a pie dish, I just use my hands and push it in ensuring that it covers the entire dish. You don't want it too thin or too thick. Bake at 180C for 10 mins max. I popped all these ingredients into my mixer, make sure to mix thoroughly before pouring it onto your pastry. Bake for 40-45 minutes and leave for at least 20+ minutes before serving. I hope you enjoy it as much as we did. I think we will be making another one very soon. So before I go, I will quickly share my November mandala with you. This month I made Marinke Slump's 12 Round Mandala as I figured it would be a little strange doing a whole year's of mandala's without using the staple pattern used by the queen of Mandala's right?! 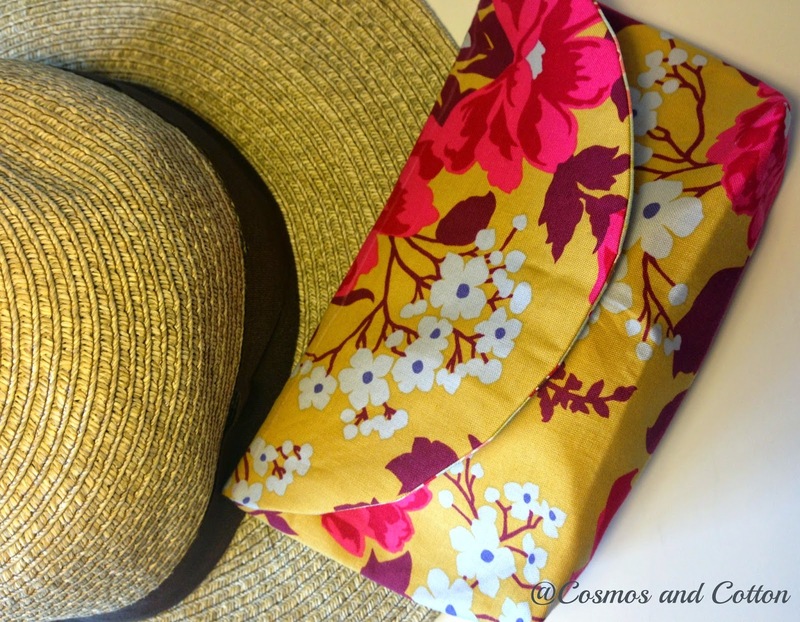 It is a quick and easy pattern to make and I really like the look of it too. Not my usual colour choices, but it was suppose to be gifted, so I opted for something a little different. Sadly I don't think I can gift it now as I am not very happy with the end result of the use of the standing stitch. It has created some holes in the mandala, which gives it a rather unfinished look. 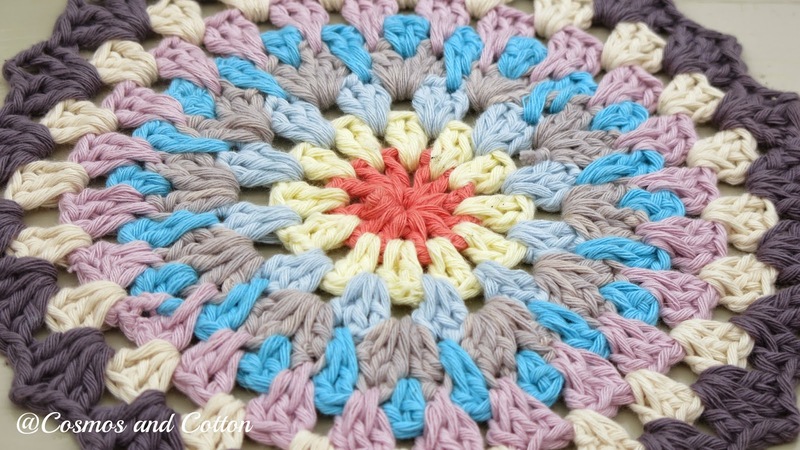 I have used standing stitches on other crochet projects in the past, but I have never used it with a mandala and I am not sure I am going to rush to do it again. 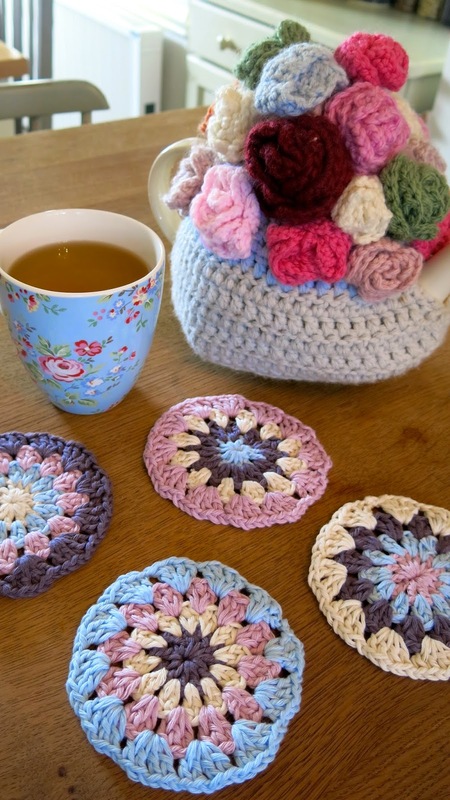 I would really like to hear your experiences with using a standing stitch with mandala's or crochet in the round for that matter. Did it create a holes??? 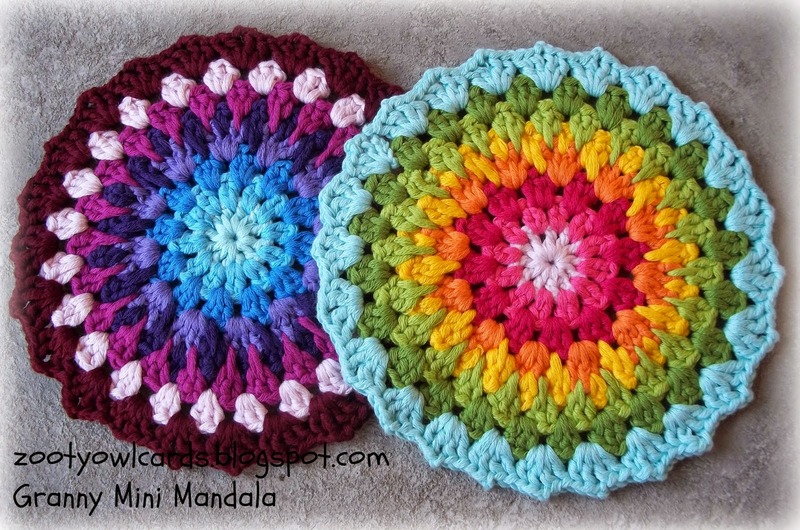 Last month I also mentioned that I had an idea and well, I figured a few mini mandala coasters might come in handy. What do you think? I really like them and they are so so quick to make. It took me an evening to make all four, so I have a little nifty plan to hook up a few more to slot into some Christmas presents. Speaking of Christmas, this month I decided that we should hook up something in preparing for the big day in December and I figured if we like it, it gives us enough time to make a few more for presents. Fortunately the very lovely Annette behind the gorgeous blog My Rose Valley kindly agreed for us to use and share her beautiful Christmas Mandala, so who's playing? It looks like a straight forward pattern to work and I love the Scandi chic style finish that it gives. I can see a few of these scattered around the house at Christmas. So for anyone on Instagram, please make sure to use the following hashtags: monthlymandalong, christmasmandala, myrosevalley and that way Annette can also see what you guys have been hooking up. Obviously I would still like you all to link up your pretties at the bottom of the page, so go on grab your hook and some christmassy cotton, you know you want to!! So that is it for today my lovelies. 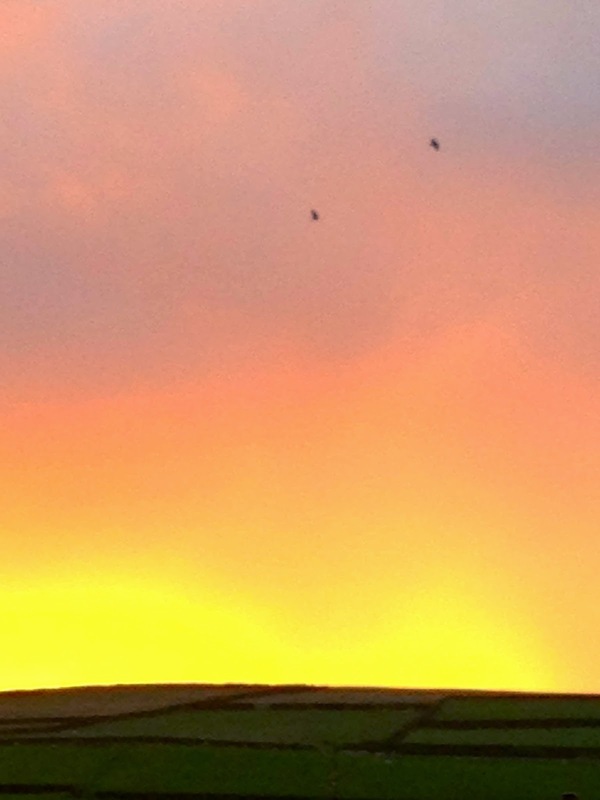 I have been thoroughly enjoying some very beautiful sun rises before the clocks went back last weekend. We have been quite lucky that its been quite mild here in the North of England, but its all set to change tomorrow, so get those woollens out and light those fires or if yore lucky enough to live in the southern hemisphere I suppose it's flip flop time. I hope you are warm wherever you are and I also wish you all a beautiful and happy November. Hello lovely readers, it seems that I have been a little quiet here lately, but I intend to make up for it in buckets today as I have heaps to share with you. September has been a beautiful month here in the North of England as we were blessed with beautiful clear skies and warm autumnal sunshine. This meant that far too much time was spent on my yoga mat outside and far too little time holding my crochet hook, logging into my computer or let alone mention the old sewer that seems to be gathering a great deal of dust of late. 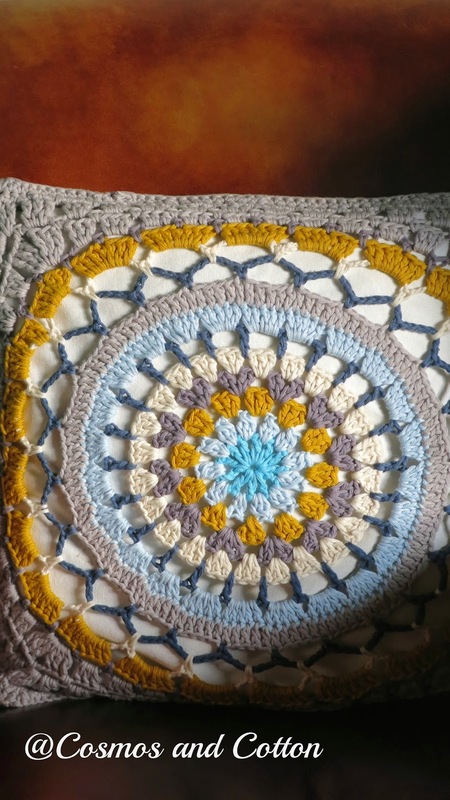 I did however manage to turn my September Monthly Mandala, that I wrote about here, into a cushion and I must say that I am rather pleased with the outcome. 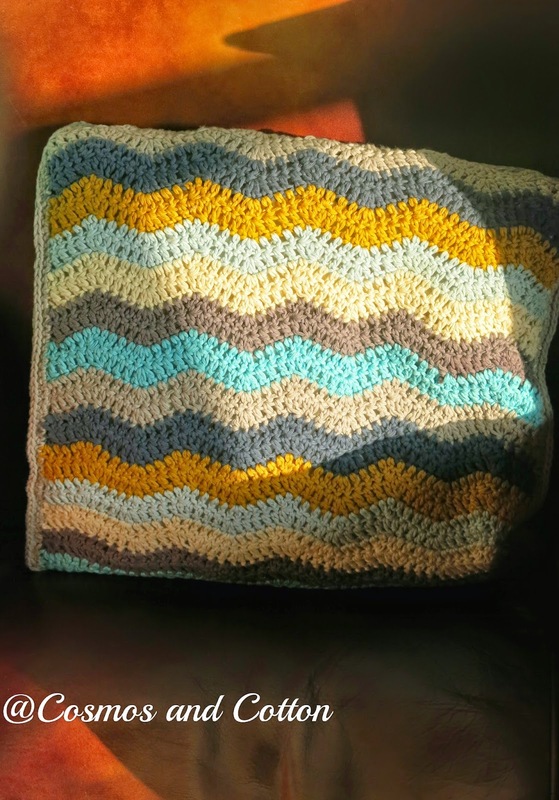 It has been my intention for a while to make a ripple blanket, but seeing that I still haven't managed to get around to it, this seems to at least satisfy a small part of that chevron urge, for now anyway. Sadly the light at this time of year is not particularly good in this little space of ours and to be honest the photo doesn't really do it justice. I don't know about the rest of you in the Northern hemisphere, but there has definitely been a shift in light and rooms are feeling much darker (and colder). I have started lighting candles again and there is no doubt that autumn has finally kicked his cold toes under my blanket. 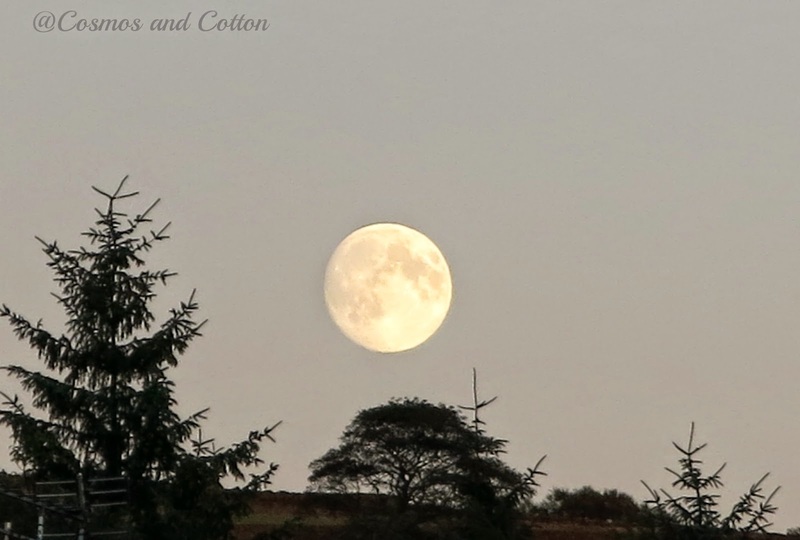 For me this change most certainly became most noticeable after the appearance of the Harvest moon this month, did you see it? Oh my it was really spectacular! They say that it tends to be larger and more colourful than other moons due to the tilt of the earth and the reflection from the atmosphere and I have to say that it looked so very big and colourful from the bedroom window. 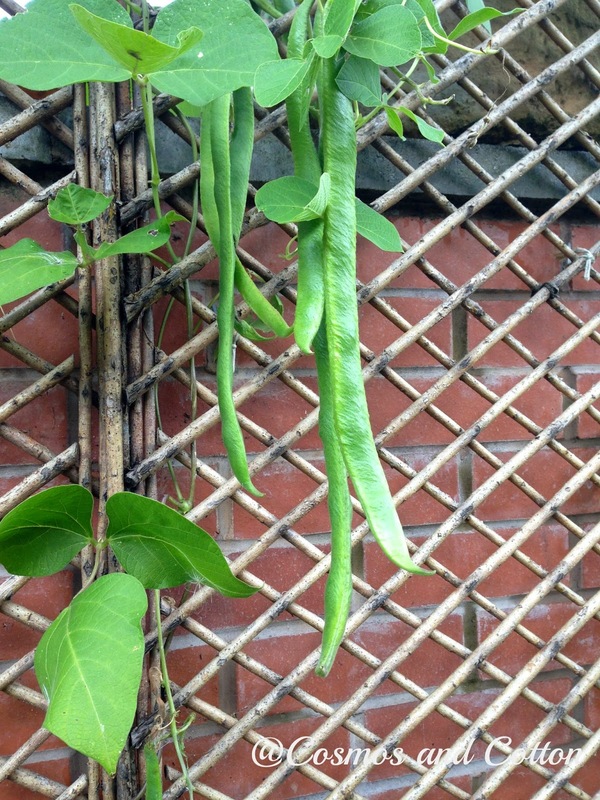 September has been a month of harvest here too, with runner beans, cucumber, beets, and lots and lots of kale making it into our kitchen. Fortunately it also seems that we may even have enough Kale for another month or two, which is a blessing as we do love a bit of Kale in our house. Have any of you tried making kale chips, if not you must, its so easy (kale + olive oil+ salt+oven=delicious!). 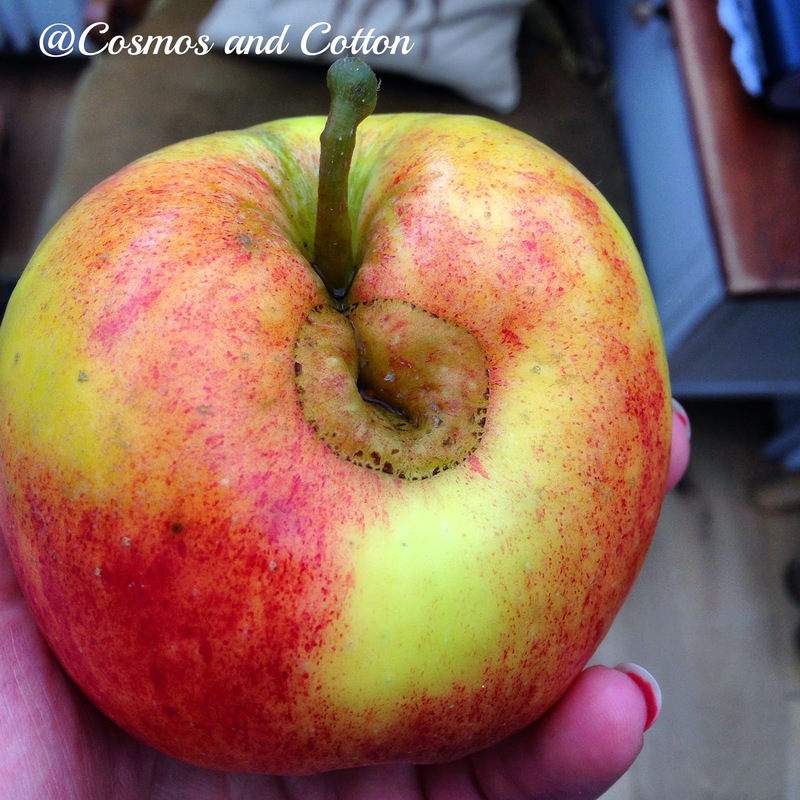 I also enjoyed the last of our delicious apples and am currently thinking of ways in which we can squeeze in another apple or pear tree in the garden, but I am faced with the slight dilemma that the little wendy play house is in the exact spot I would like to plant it, so I might have to wait a few years for the kids to outgrow their little space. September has been a month of struggle with my health, but it hasn't stopped me from becoming even more obsessed with yoga than I already was (not that I thought that was possible!). I was also incredibly lucky to enjoy two days of being taught by the very talented yogini, Kino MacGregor. Lets just keep this short and say that it was one of the most amazing experiences of my life, I really enjoyed every minute of it even though my batteries were a little flat at times, it definitely is a memory I will always cherish. Here is a little memento of my weekend with Kino. 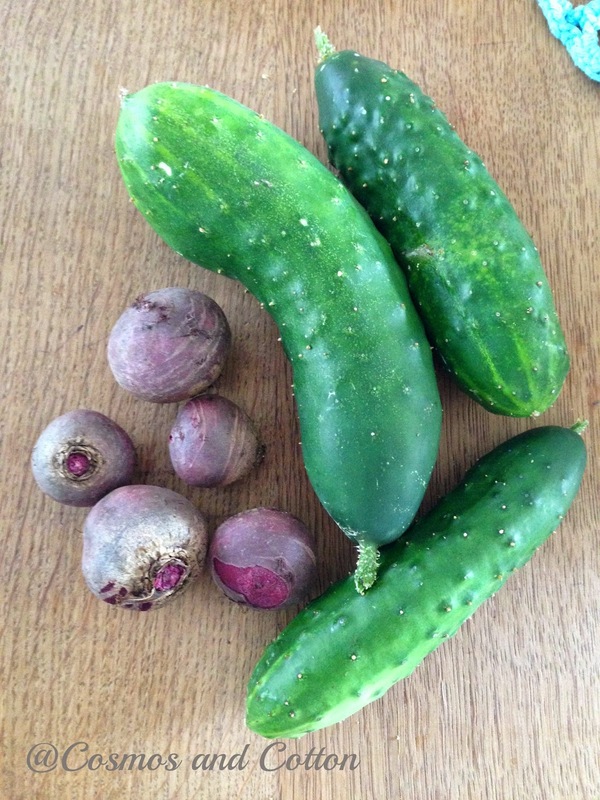 September has been a month of slowly getting back to warmer foods and soups. I have experimented with Vegetable Soup, Tomato and Basil soup and made my all time favourite Carrot and Coriander Soup. For those of you who follow me on instagram @Scrummytritious, some of the recipes are there. 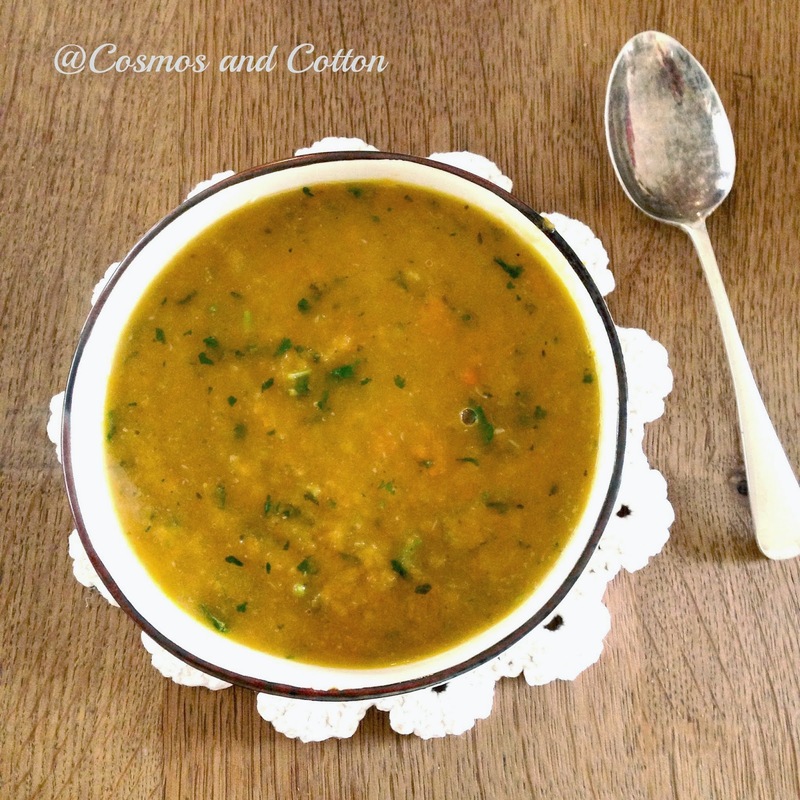 For the rest of you, here is the recipe for my vegetable soup. Chop all your vegetables (medium size chunks). Gentle fry the onions and carrots for around 5 minutes, then add the celery and cook for around 5 minutes before adding the stock and water. Bring to boil and then reduce to a simmer and then add the courgette. Cook for around 10 minutes max and then add the coriander before blending it partly with a hand blender, leaving some chunks of vegetables in there. Enjoy! Septemeber also saw the return of a loaf of bread to our lives. We have now been Paleo gosh for around seven to eight months and even though I wasn't having much bread before I was still enjoying the odd bit of grains, like rice and things baked with brown rice flour every now and then. 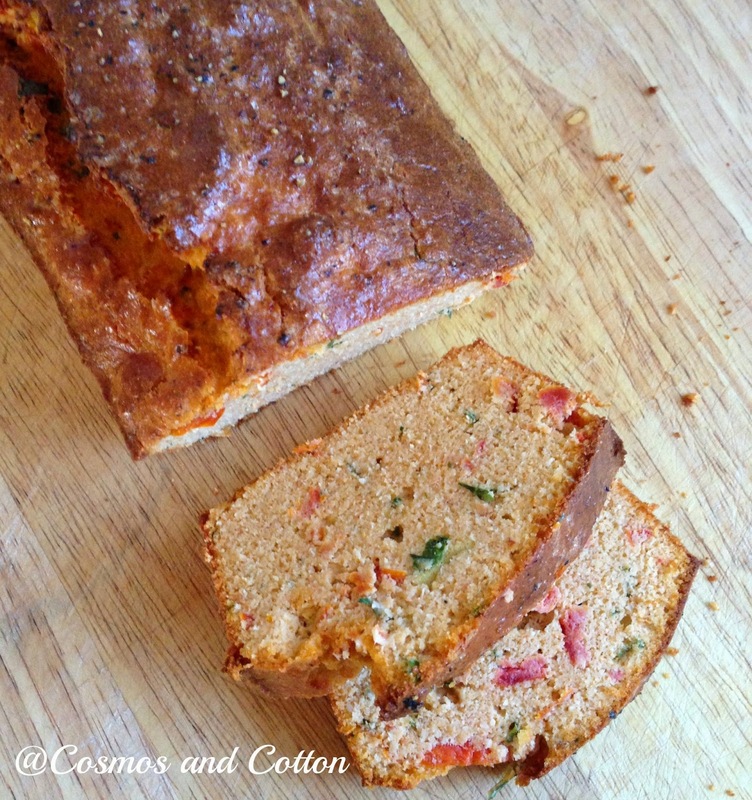 This recipe for this delicious Sun Dried Tomato & Basil Bread is completely Paleo and made with ground almonds. I use ground almonds often, but have never thought of making a savoury bread with it and I must say it was delicious and I will definitely be making it again very soon. 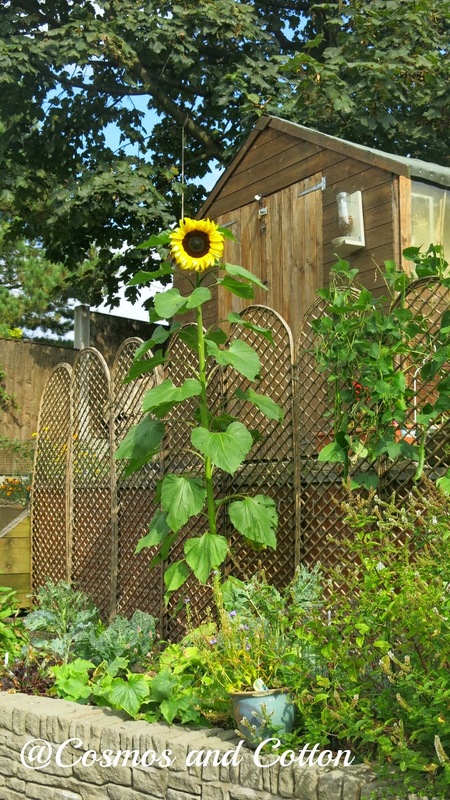 September saw our gigantic sunflower come into bloom. 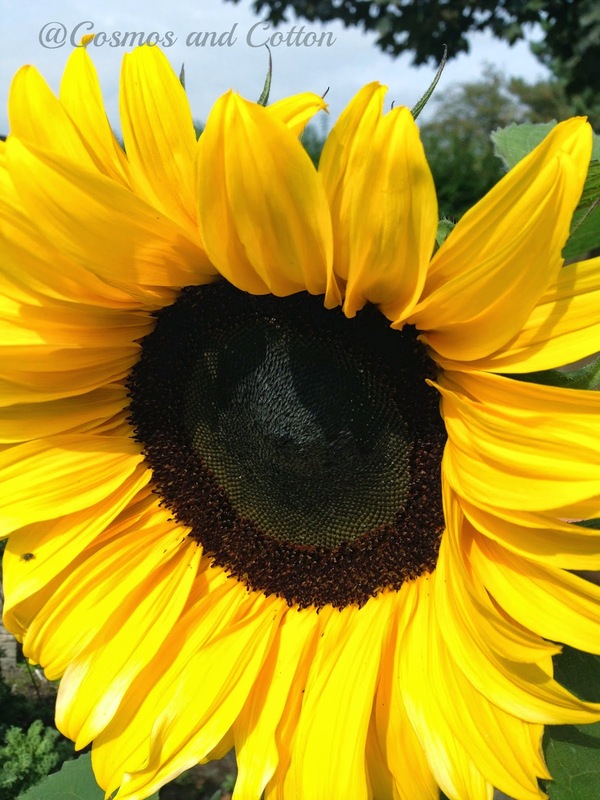 For some reason we NEVER succeed in planting sunflowers and even though we planted over seven establish seedlings, I think the Raven's and Jackdaws must have been too quick to dig out the seeds still attached to the plant. Does anyone else experience this? Fortunately for us, this beauty was overlooked and how very special for us. 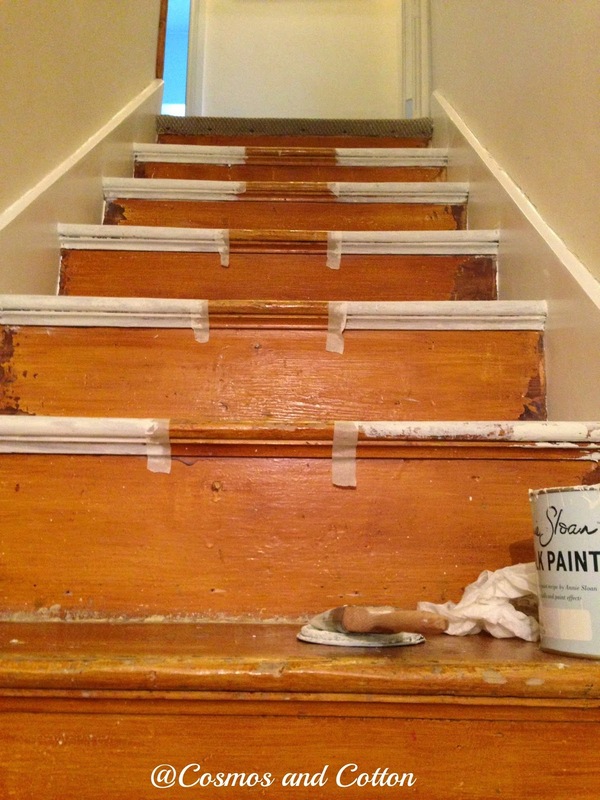 September also finally saw the final touches going on to our stairs that has been a WIP for many many months. 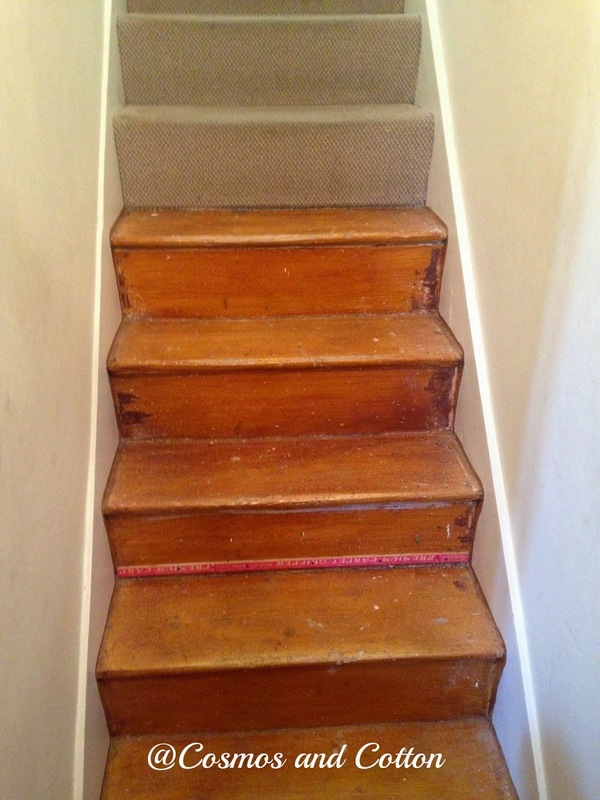 Earlier this year I had this massive urge to remove the rather tired looking carpet from our stairs. To be honest it is something I have been meaning to do ever since I since I received this beautiful book from a friend for Christmas 2012. The problem you see is that I never thought I would have the guts to pull and see what mess lies beneath an old tattered carpet. Well it seems that one very cold and frosty January morning, those worries and concerns where very far from my mind, instead I felt brave and ready to conquer all (I must have had a mild does of brain freeze one thinks). I must add here that it has taken me a little longer than anticipated, but I got there in the end and wow, what a transformation. 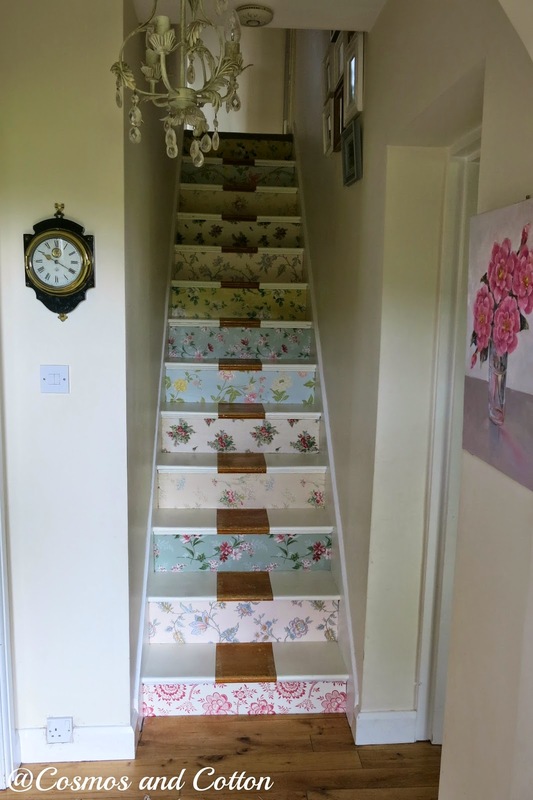 I love this idea and it has made such a difference to the light and feel of our very narrow staircase. 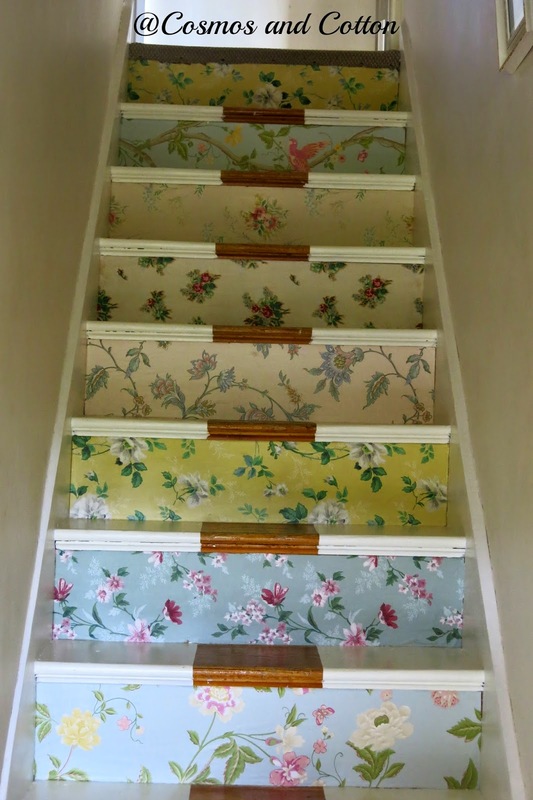 Thank you Sarah Moore for your wonderful inspiration, it seems collecting old wallpaper does come in handy after all. I used an eclectic mix of mostly old, but a few modern prints are hiding in here too as I really like the combination of old and new. 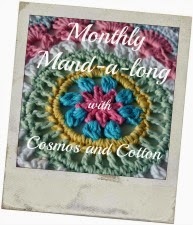 Last, but not least, September has also been a month for yet another monthly mandala and this month it was the rather sweet little mandala pattern by Zooty Owl as mentioned here. 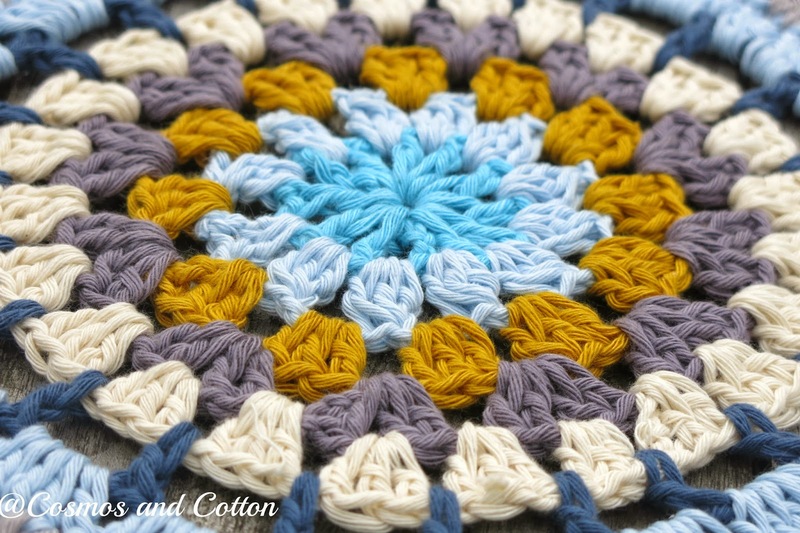 This fun little Granny Mini Mandala pattern is super quick to work and as I have also come to realise, it offers some rather fun alternative possibilities, but more on that another day. For now though it is show and tell time. 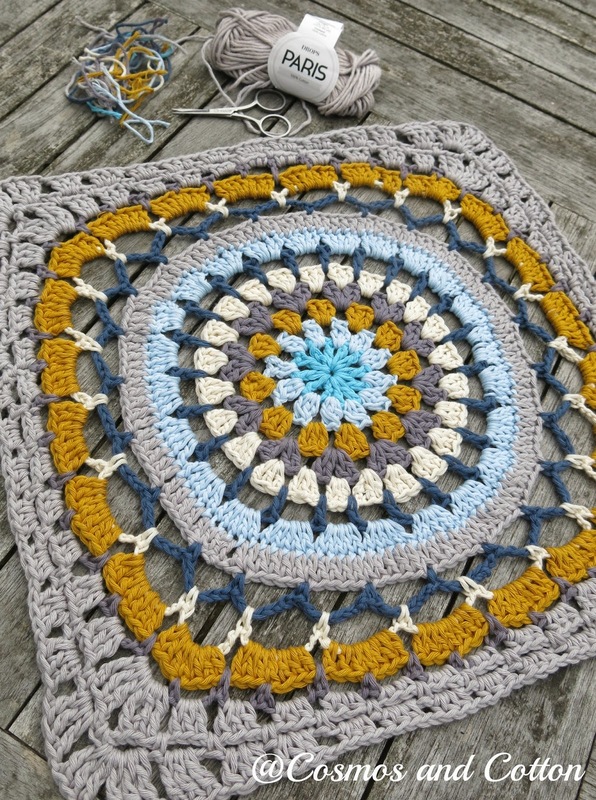 So for any of you who have joined in the yarn mandala fun, please add your mandala below. 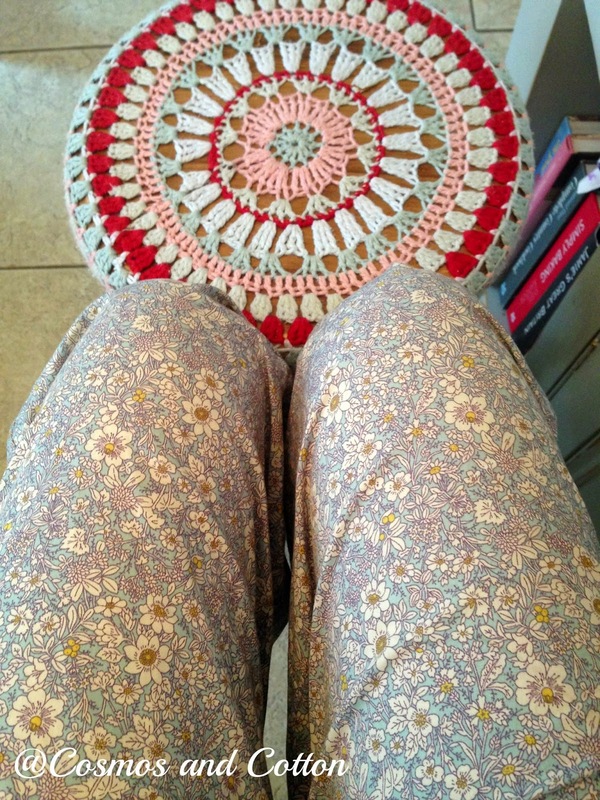 For next month I thought it might be fun to try Marinke Slump's 12-round mandala. For anyone interested you can find the pattern on Ravelry. 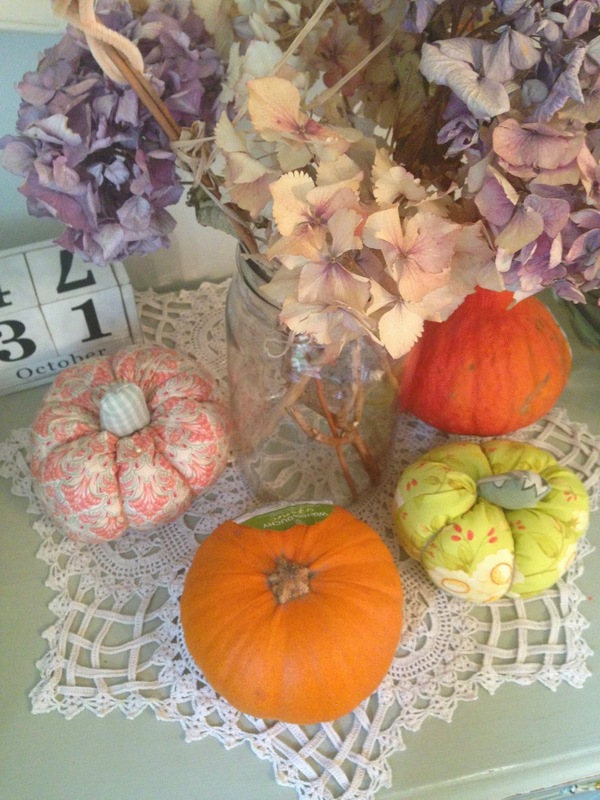 Wishing you all a beautiful October. Helloooo. Well it seems that our lovely summer holiday has finally come to an end and the kids returned to school today with rather glum faces, and in truth mine wasn't a pretty picture either. I have so enjoyed having the kids at home, it truly was a blessing and even though there were moments where I felt the need to pull my hair out (well actually I would need more than a moment to achieve this), on the whole it was peaceful and fun. Both little J & E mostly played together harmoniously and have somehow rekindled their love for each other, something that usually gets lost during term time, I mean its not really cool having your small sis as your best friend. When the kids were very little, well up to the point when they both went to school, so really not that long ago, we always found that they would prefer to play with each other when in the company of others kids. 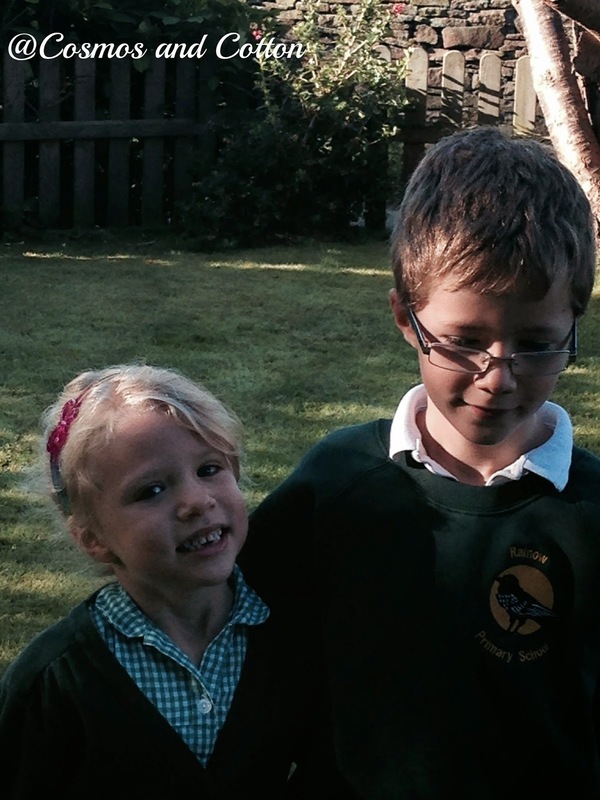 I use to really love this about my kids, this deep routed love that they somehow have anchored for each other, possibly during some difficult years where we were cooped inside whilst I was housebound, but like they say, every cloud has a silver lining. Even this morning when we set off for school there were hugs for each other (obviously NOT in the playground, oh heaven forbid! ), but it melted my heart. To be honest I didn't need anything to melt my heart this morning, I was tearful from the moment I woke and when I had big cuddles with little J, he was very perplexed as to why Mummy had all these tears streaming down her face. Oh how do you ever explain the love you feel for your child. The love of a parent is something so special, it is a gift and one that should NEVER be taken for granted. I feel sick as I sit here and type this as the house is quiet and my babies are most probably very ready to come home, but what scares me most is the pace life is moving. In a few years I won't have these long cuddles with my son where I can plant a million kisses all over his face whilst he buries his head in the fold of my neck. No, I know, they will be replaced by silent grunts even when he has the urge to hug or kiss. Thankfully we can capture these moments and seal them at the bottom of our hearts and hopefully we can hold on to them till our very last days. One thing I have learnt from the last seven years is that every new phase bring new beautiful memories, so I know they don't end here. So, to stop the flow of tears, I am swiftly moving on to something a little more cheerful, yes my Mandala. I must confess that I am now officially in the habit of leaving this to the last minute so I will endeavour to start this a little earlier next month. 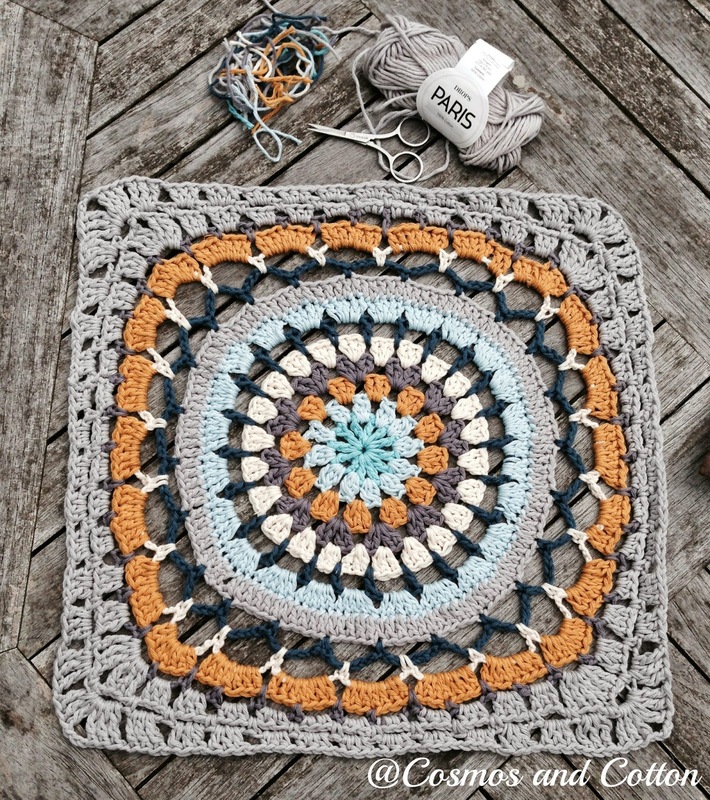 This months mandala was the Daisy Centre Mandala Square by the very talented Zelina Olivier. I again used Drops Paris, as it simply is the best yarn for mandala's in my opinion, if you take away the weaving in ends bit. For some reason the cotton always splits when you try and weave in the ends, which is really the only thing I dislike about Drops Paris. It is a fairly simply pattern to work from and I wanted to have something a little different from my usual colour scheme, something a little 'warmer', yes a little more autumnal. Last winter I lost my heart on mustard and even throughout the summer I just couldn't get enough of this beautiful colour, in fact so much so that I had to invest in not one, but yes two mustard bags whilst on our jolly in Italy (but more on that another day). I must confess that there was a bit of pulling out towards the end as I tried desperately to finish this whilst trying to focus on the amazing routines on Tumble. Honestly I just LOVE LOVE LOVE everything about this show! Aren't those celebrities just doing the most fantastic job. So common spill the beans, does anyone else watch this and do you like it or love it? 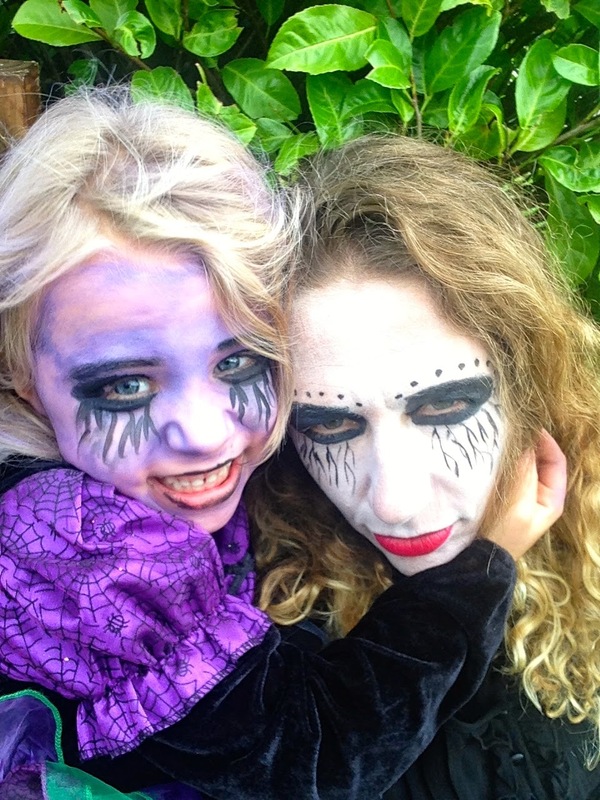 We initially recorded it for little E, who started doing gymnastics a term ago and absolutely loves it, but it seems this Mamma is enjoying a great deal more than little E. What I would do to do a little gymnastics, mind you I would seriously injure myself!!! 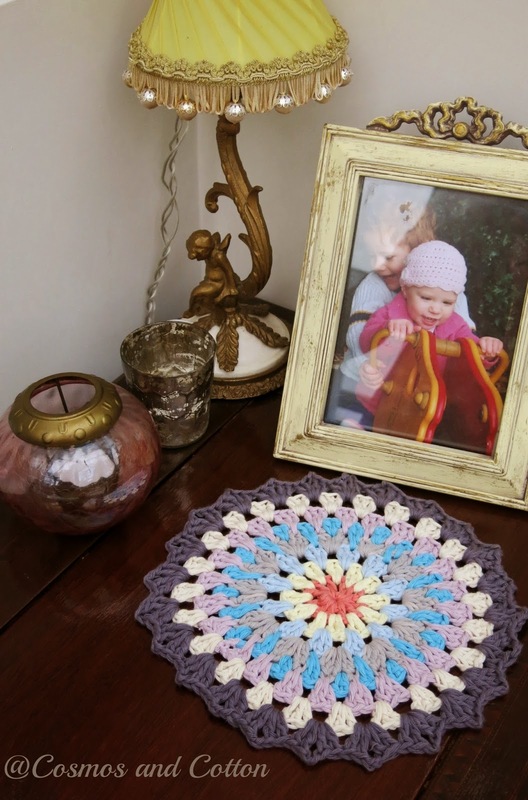 So yes the problem with crocheting mandala's is that they do involve a bit of counting and concentrating at times, which can prove a little difficult when you can't take your eyes off the telly! If I am honest I really thought that this Mandala would be a great deal smaller than it turned out, but actually I am delighted with the finished size as its inspired me to make something with it, but for now I will have to keep you guessing! Unfortunately I haven't blocked it yet, so none of these images do it justice as I always find blocking your work makes the world of difference. So for October, I have chosen something small (yes clearly I still have this urge to make a slightly smaller Mandala, so lets hope this is!) and again I have chosen a pattern by Zelina Olivier. I promise to move on to someone else at some point, but I really enjoy Zelina's designs and patterns and the problem is there are so many of them that I want to make! What I like about this pattern is that I think this pattern might make quite a few little presents for Christmas (oops, yes there I have said it!). 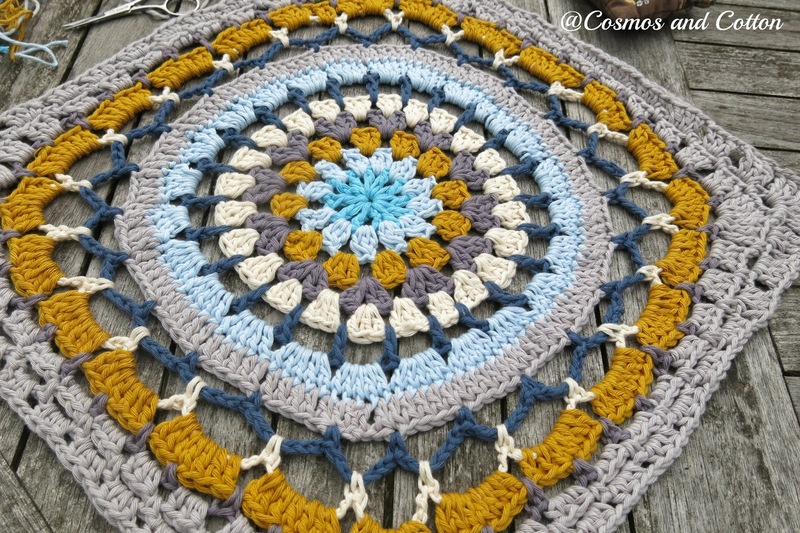 So for anyone interested in joining in, you can either make a mandala of your choice, or you can find the pattern for the Granny Mini Mandala here. That's it for today my lovelies. A big and warm welcome to all my lovely new followers, I hope you enjoy your visits here and I look forward to getting to know you a little better. 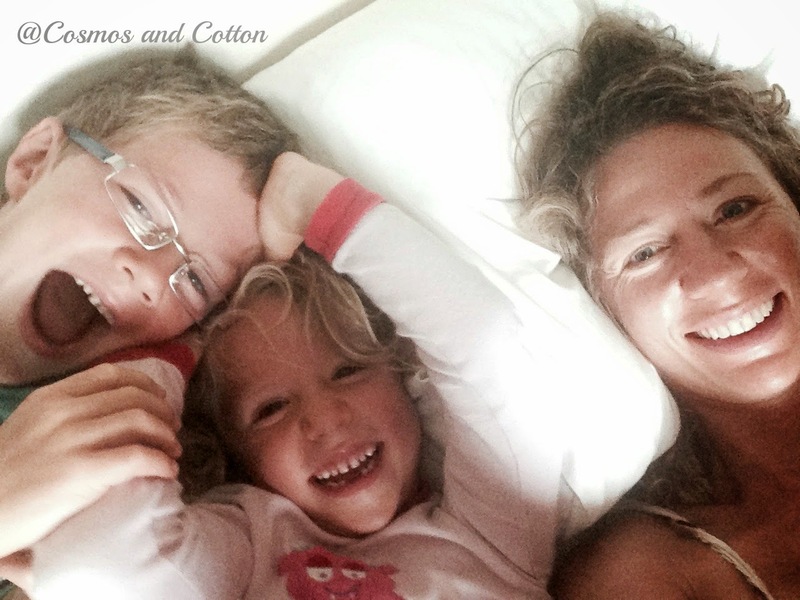 For now though I have to get the sprogs from school and I am going to leave you with a lovely memory of our last morning in bed before school started (yes not the most glamorous, but who cares about that!). 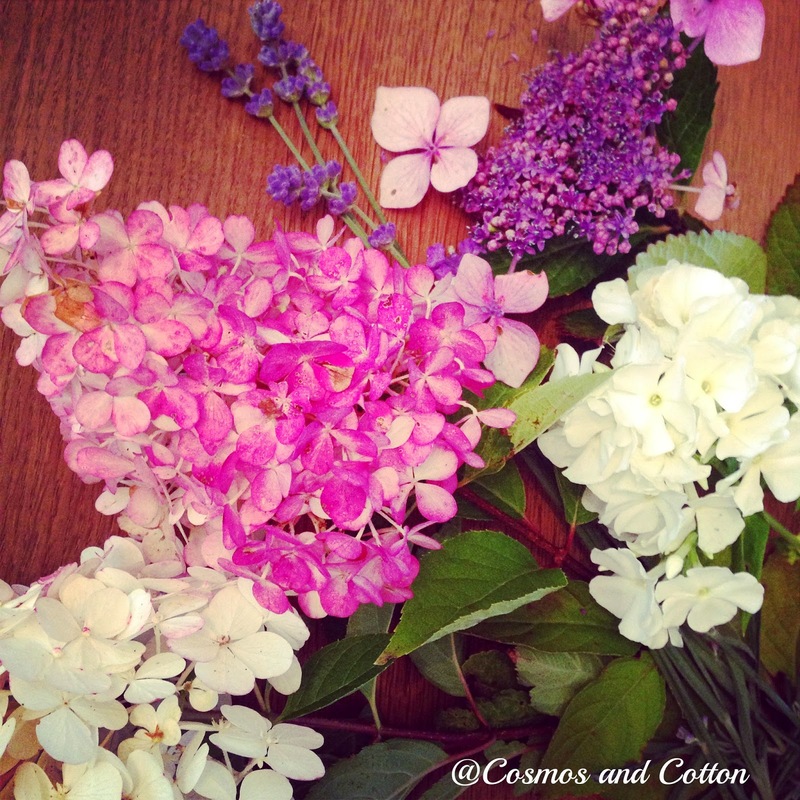 Happy September and Happy Autumn & Spring! So as promised a quick sew and tell, the truth is that if I had my way I would have my bottom firmly screwed down in front of the sewer for a good few hours a day, but hey somehow life gets in the way, but its not all bad. 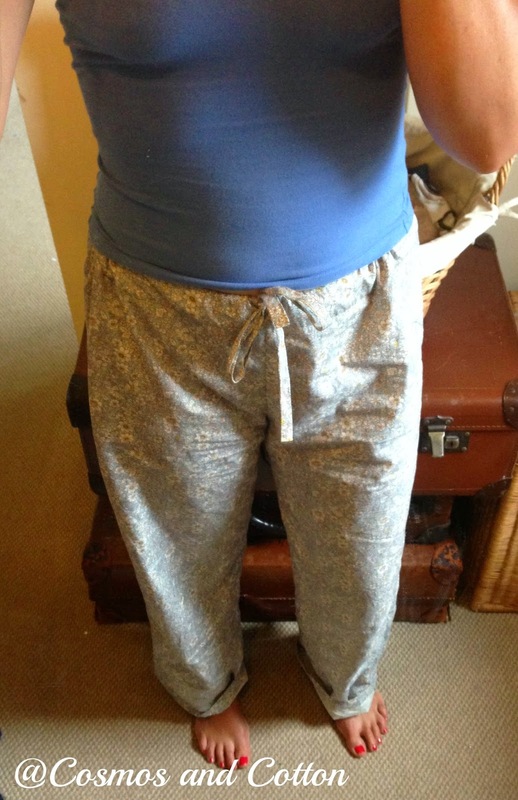 So first up is my Margot pyjama bottoms. I was so excited when I first learned that Tilly Walnes was writing a book. I absolutely LOVED her in the first series of The Sewing Bee and was guttered when she had to leave. I just love everything about her style, so needless to say when she announced that you could pre order the book, I wasted no time. 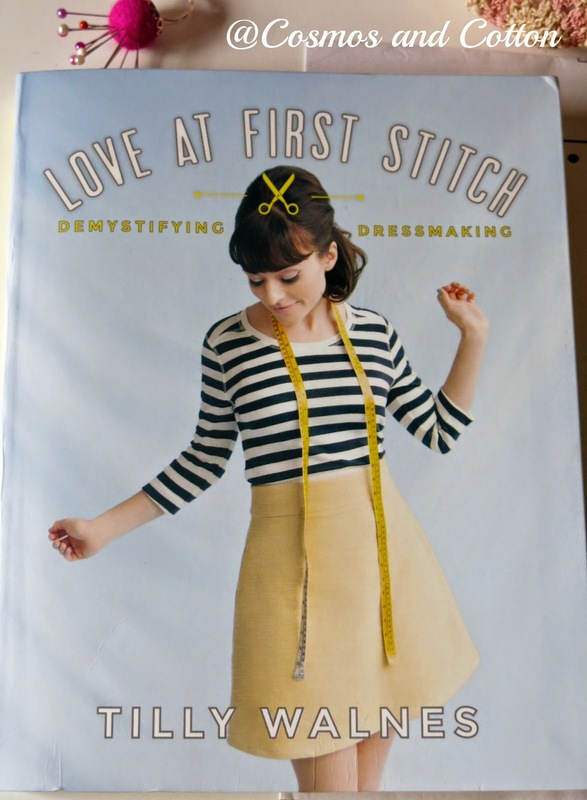 For those of you who haven't flicked through this fabulous book 'Love at First Stitch:Demystifying Dressmaking', you should seriously do yourself a favour and get your mitts on it. 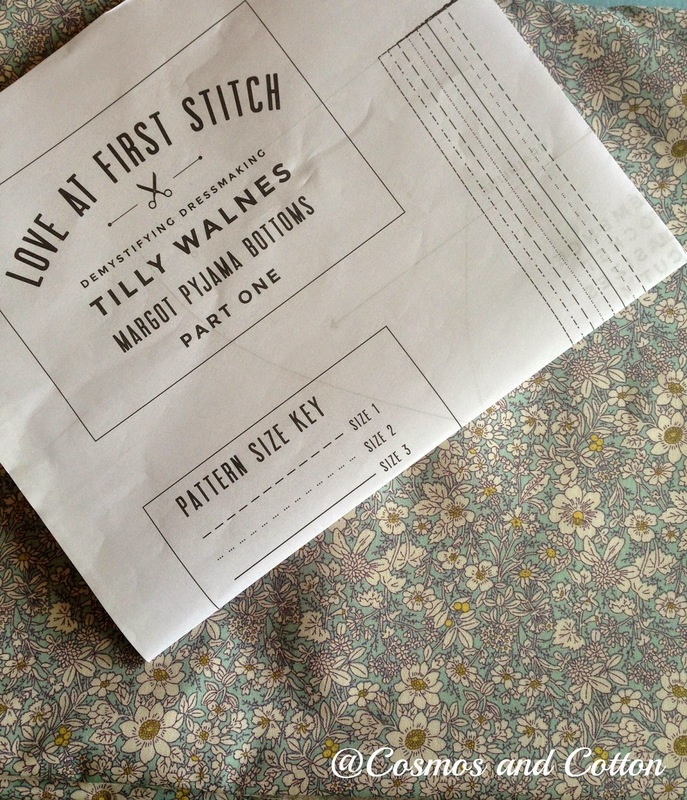 It has some really lovely sewing ideas with some lovely patterns. I really love the fact that the patterns are all full sized, so no enlarging or faffing required, which suits a gal like me down to the ground. 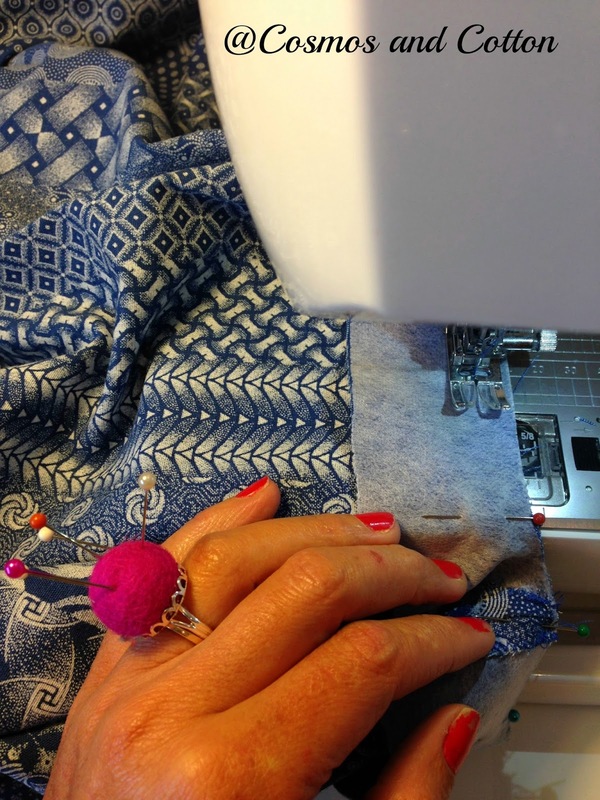 Now for quite some time I have been meaning to make some PJ's and seeing that there are quite a few easy patterns floating around on Pinterest it was only going to be a matter of time before I got around to it. The first time I flicked through this book, I immediately knew what my first project was going to be, yes you guessed it, the Margot PJ's. 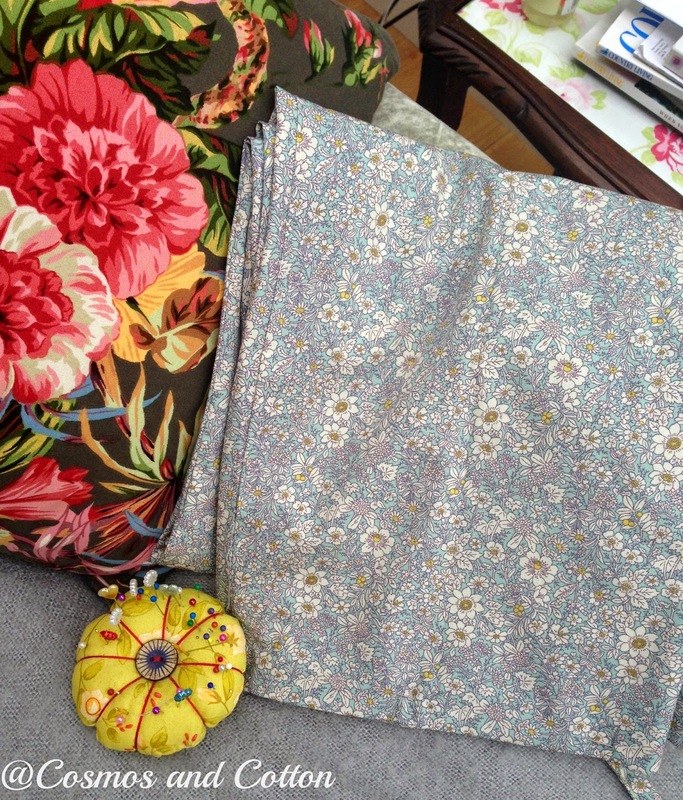 I bought the fabric, but as is often the case it got put to one side to make room for something else, well that was until I could wait no longer and as they say the rest, well, was history. These are really easy PJ's that you can make in next to no time. I think all in all (ignoring hand sewing the hem) it took me a few hours, but now that I know what I am doing I suspect it will take me a little less time to make the next pair, they are just too comfy not to! A few weeks ago, I spied a fabulous looking magazine on no other than the very lovely Daisy's Instagram feed and it was only a matter of days before I was flicking through it. I love everything about this magazine (thank you Daisy! 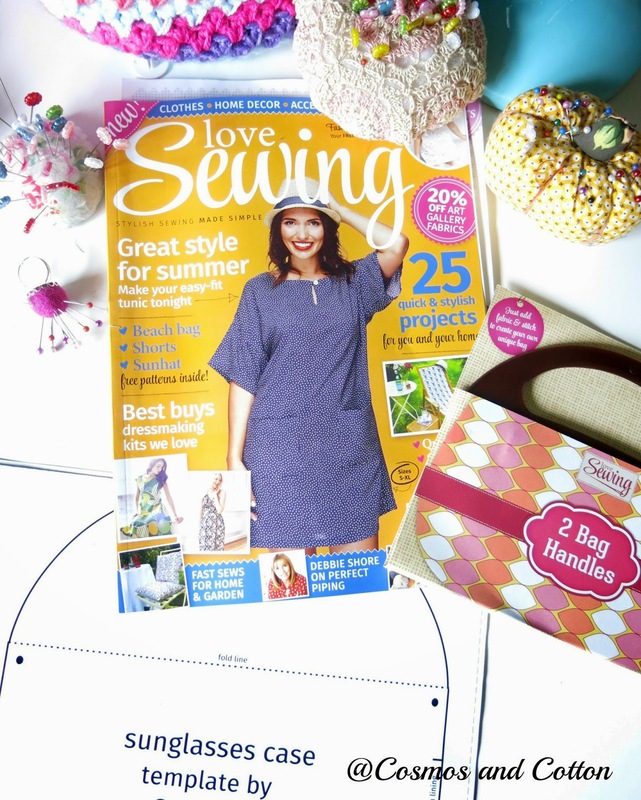 ), it is so varied with so many different and lovely sewing ideas and projects, in fact I can feel a little subscription coming up, ssshhh don't tell hubby! 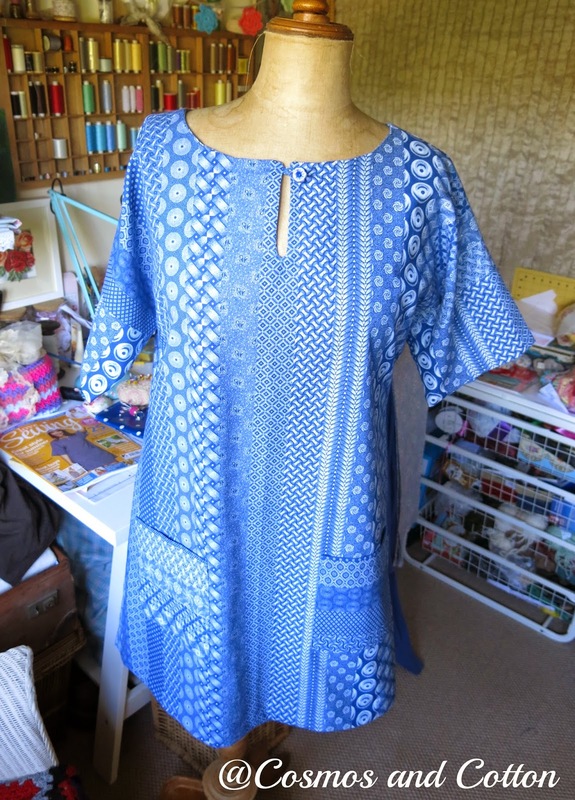 This months issue comes with a pattern for a rather lovely little tunic, so I wasted no time in reaching for my shweshwe fabric, which I purchased during our recent visit to South Africa, and got started. 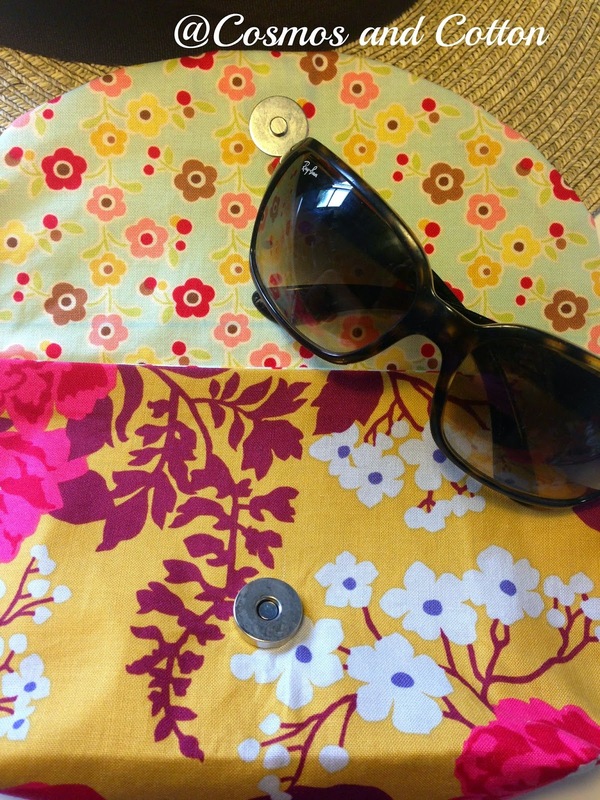 Again, seriously, this is an easy peasy pattern to follow and such a quick sew for a rather lovely finish. My only criticism about it is that it came out far too big for my liking so yet again I had to take it in! This seems to be an ongoing trend with my dressmaking, but I suspect sooner than later I will start understanding what my true size is. If it wasn't for the alterations, this would have taken no more than a few hours from start to finish. 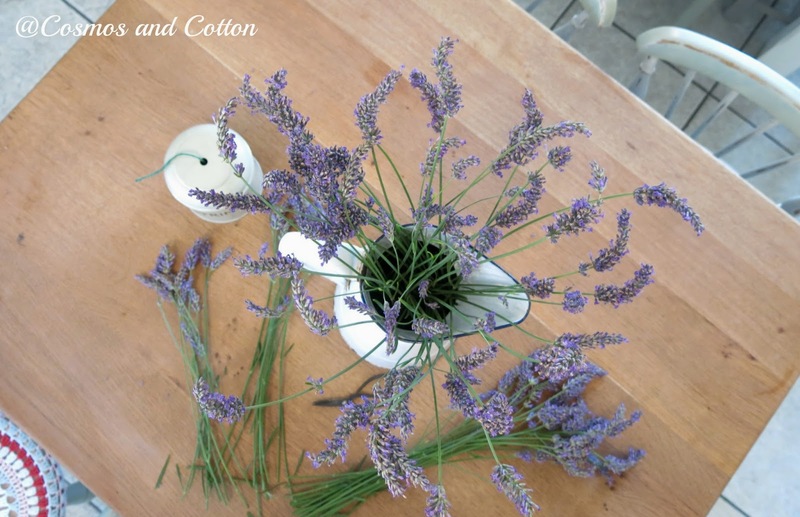 It is simple and uncomplicated and for any new sewers out there, give it a go!! I am definitely going to make another one, in fact it would seem a shame not to! 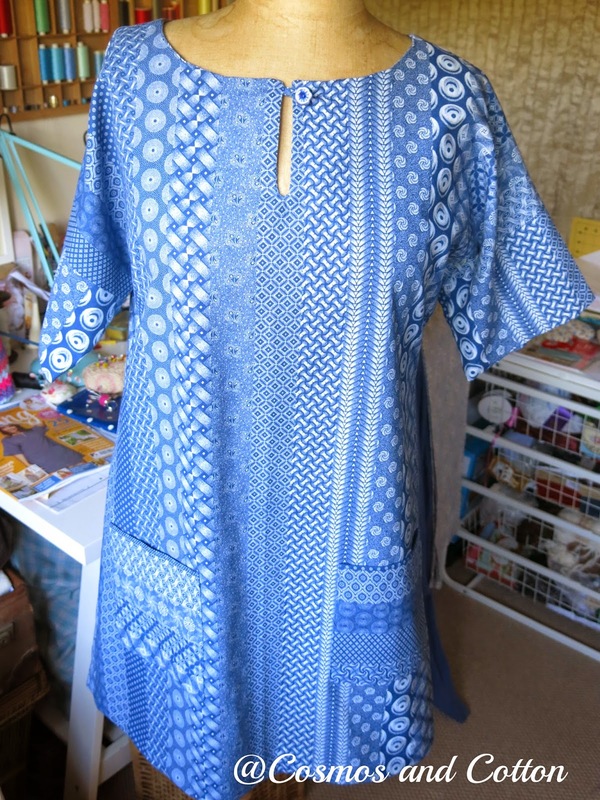 Fortunately it was really quick sew that I just about managed to squeeze in and I must say I'm very impressed with yet another Sewgirl pattern. The only criticism, yes you've guessed it, its a little too big for my liking ;-), in fact its the perfect little make-up bag. 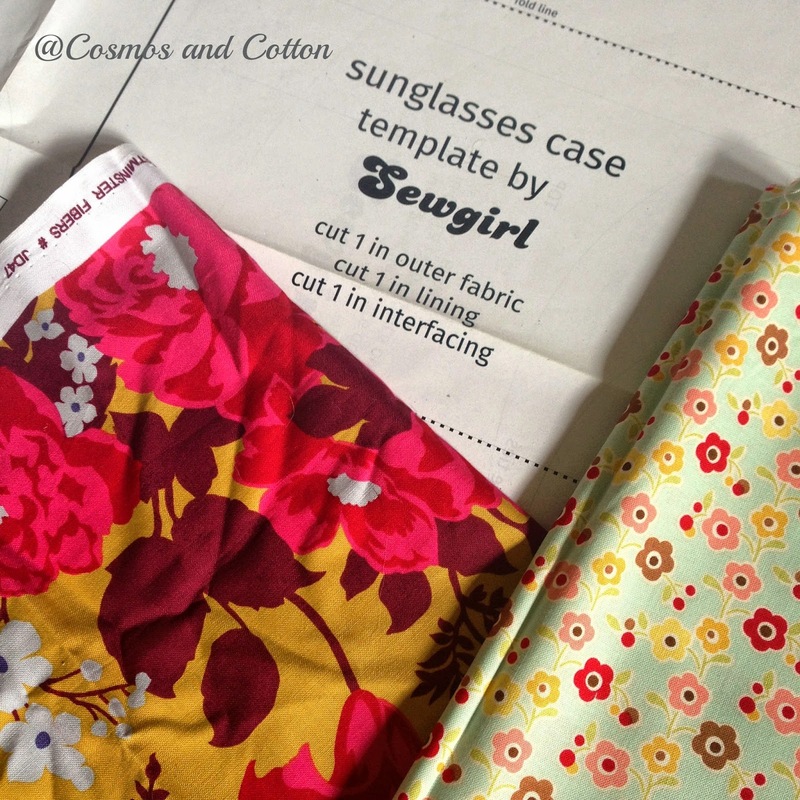 So that's it for today and for my sew and tell. 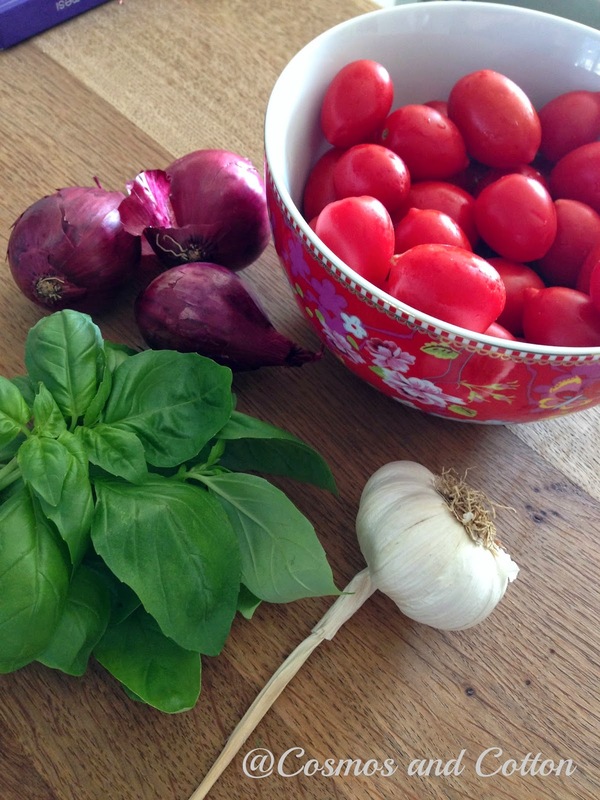 We are soon jetting off on summer jolly and going back to beautiful Tuscany, so needless to say we are all feeling a little giddy with excitement, but as usual there is quite a lot to get ready and prepared, so I better get on with it! 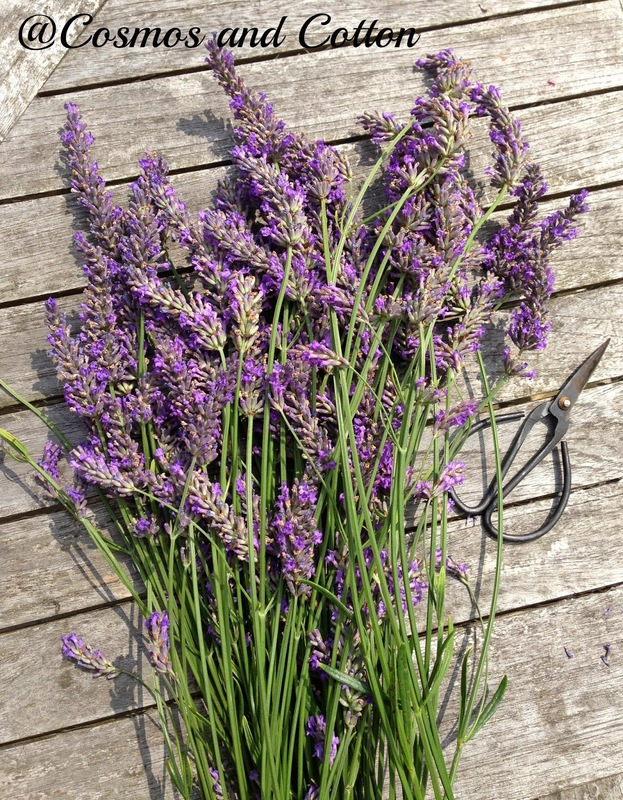 Wishing you all a beautiful couple of week and leaving you today with some beautiful lavender from the garden (Ma this one is for you! ).